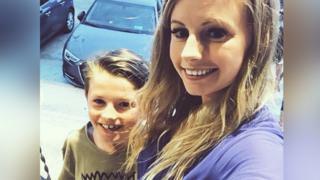 An eight-year-old boy took control of a car at 60mph and steered it to safety across a busy dual carriageway when his mother blacked out at the wheel. 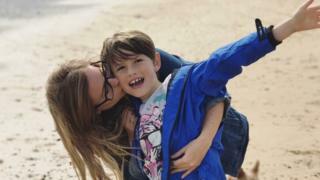 Ben Hedger was on his way home from school with mum Lauren Smith when she had a seizure on the A120 near Colchester, in Essex. The Ford Ka hit the central reservation and realising the danger, Ben put on the hazard lights and guided the vehicle across the lanes to the hard shoulder. His mum said she was “so proud”. Miss Smith, 27, who lives in Colchester, lost consciousness at about 15.45 GMT on Monday. “When I started having the seizure at first I grabbed the wheel and was steering erratically so because of that we moved from the left lane into the central reservation and crashed into that,” she said. “We were scraping along and that is when Ben realised he needed to do something. Miss Smith said Ben had not realised how serious his actions had been. “He realised something was wrong with me but he didn’t realise he had done this amazing thing. After pulling the car over, Ben tried to use his mother’s phone to call the emergency services before another car stopped and helped them. Miss Smith, who came around after five to 10 minutes, said she had never had a seizure before and had to be told about what had happened by Ben, the emergency services and a fellow driver.